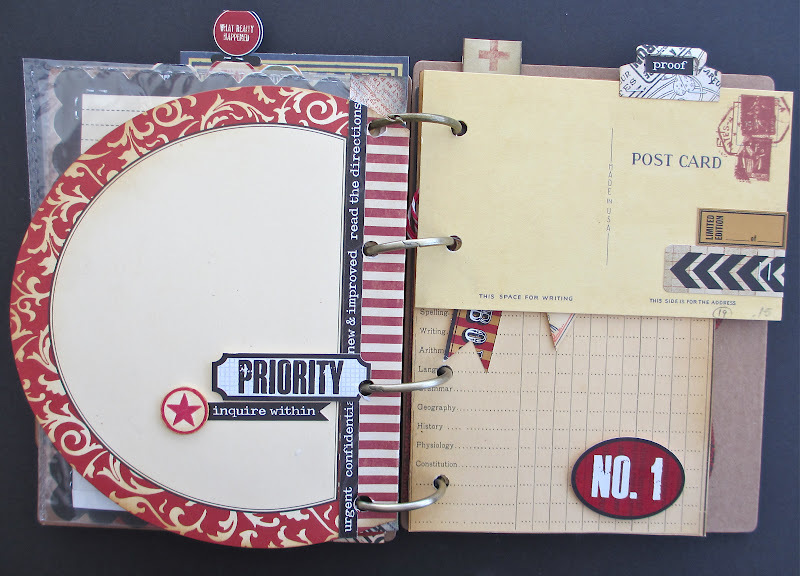 Today I am sharing the journal that was created by the ever fabulous, Sande Krieger for the Inspired Journey Event I attended last week in Manhattan Beach. I helped Sande in her classes so I was able to make one of the journals before the event so I would be familiar with the project. Today's post is sort of a "blog hop". After you see the basic journal here, use the links provided at the bottom of the post to see Sande's completed journal on her blog, Pandemonium. Then you see her true talent shine. I have never met anyone who can use plain ole letter stamps like she does...certainly not me. Note: I somehow came home without page 2 which should be showing in the this picture. SO when you look at Sande's final journal with all the picture you will see a page that has a flip up that is tied with a black ribbon, that is my missing page. sorry about that! What you are seeing here is a plastic 4 x 6 photo sleeve. 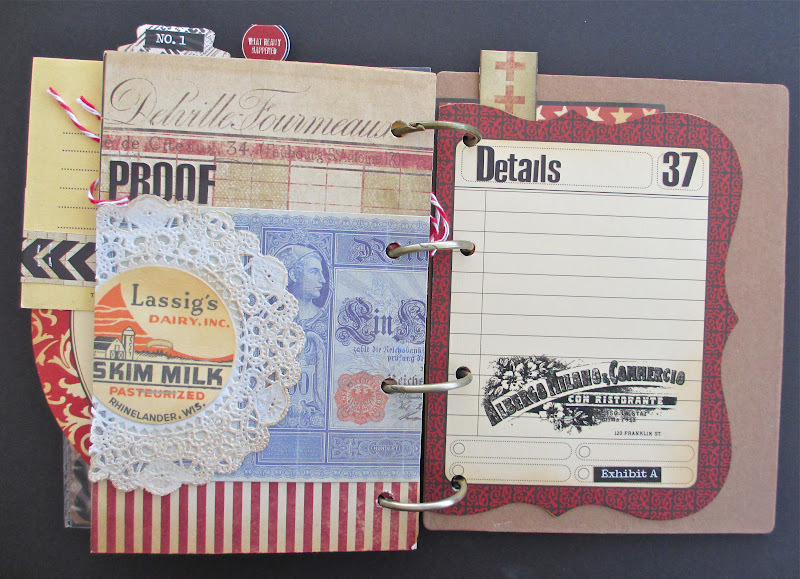 Sande covered the inside edge with a strip of paper then punched with the Binderie Punch to add to the book. The stickers were placed right on the plastic sleeve and even though you can see they are white on the back now, once you slide a picture into the photo sleeve the white will be covered up. 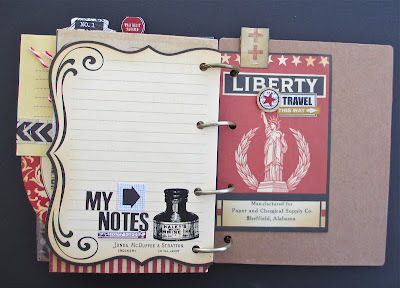 Love this idea of the punched Gypsy tags. Sande added a number at the end of each tag set. You will see in her book, she used each tag to stamp out a note about the picture that is added in between. 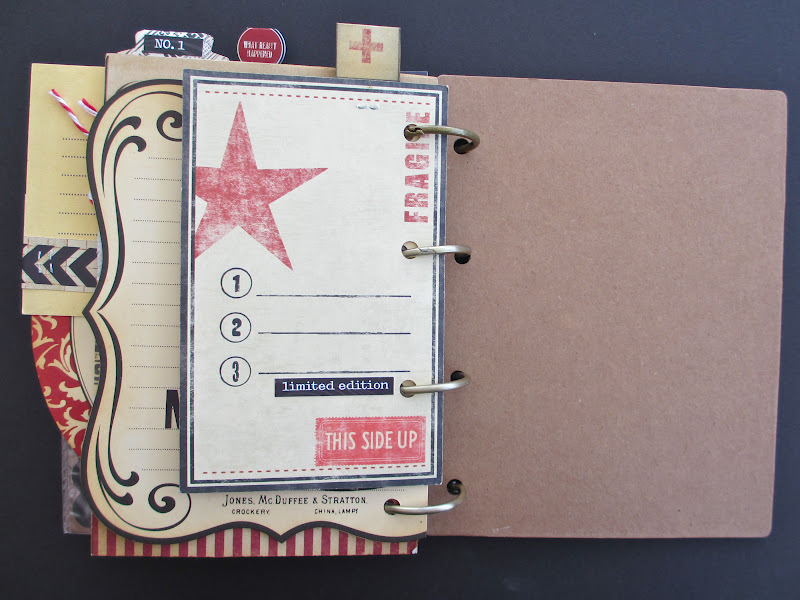 Each of the shaped pages through out the journal were made using the Photo Carousel cards...we clipped off the tabbed edges or added paper over them. The back of this one was made into a pocket. Here we used two 6" Elastic bands to create a holding place for a Petit Carnet. Clever girl, that Sande! The pennant is made from part of the Vagabond sticker, ephemera and a tag:vintage. Held in place using mini paper clips and paper fasteners. So that's it, the basic journal that everyone made in class. 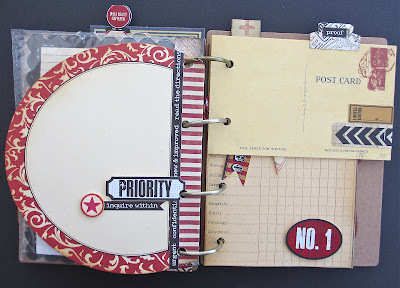 Now, hop on over to Sande's blog to see the real deal where she has added all her pictures and journaling in pure "Sande style". It really is fabulous. 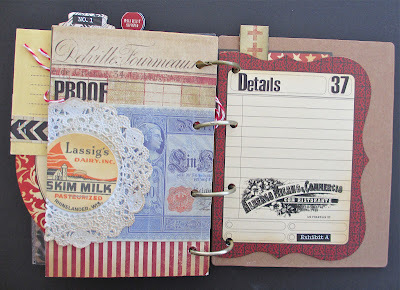 Part One - The inside of the Petit Carnet and start of the journal. Remember I am missing my page two. So there is an extra page that you will see in Sande's completed journal. 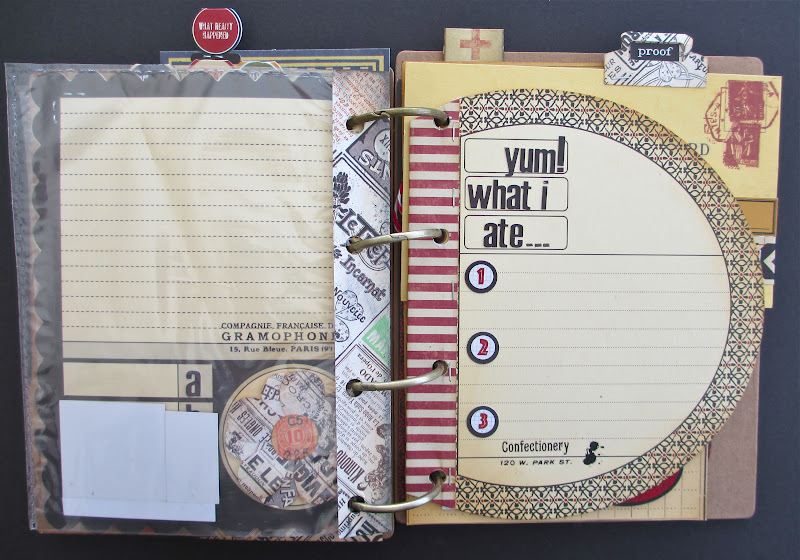 Love your journal/scrapbook. 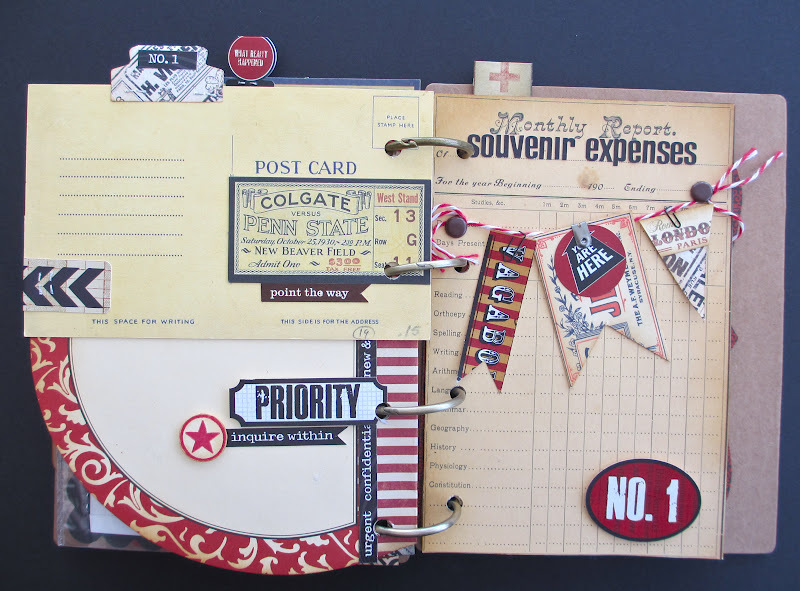 Makes me want to pull out all my papers and such and start scrapbooking......Thanks for the inspiration! 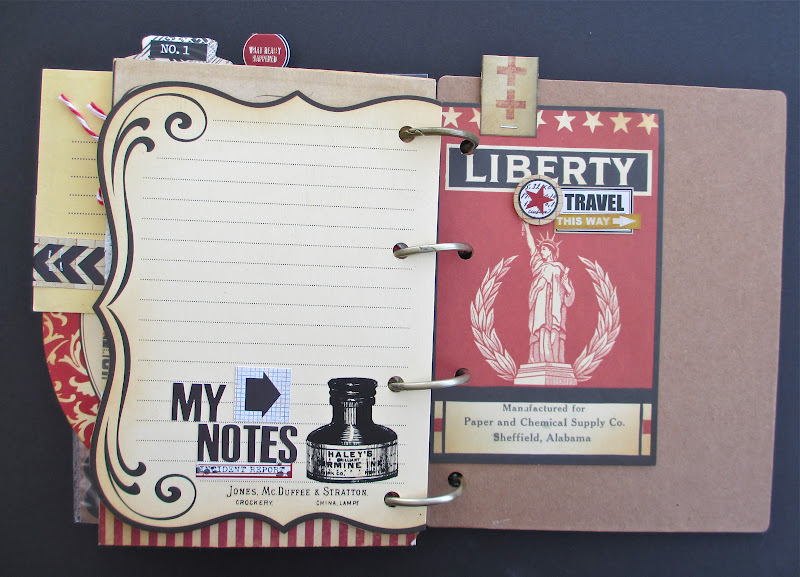 Such a cute journal! It makes me think that I could do something like that for maybe a time capsule for my kids. TFS! Wonderful project! (Love blue glasses!) Thanks again - I am inspired. 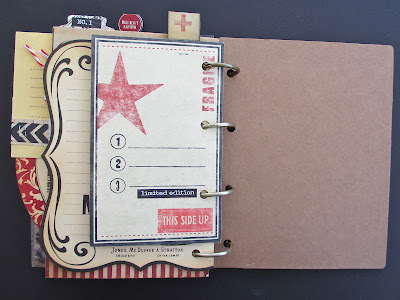 Fabulous Journal! Love the concept Thank you for the inspiration. Great journal, Paula. Sure would be a nice project should you ever decide to come to St Pete!! This is awesome - I love those products, I just bought a bunch of the new ones, and I have a TON of the older ones on hand! I am just getting ready to make an album for my last cruise, so this gives me some great ideas. What a great class, would have been fun to be there! I always love looking at her work. Wish I lived on the West Coast so I could take advantage of her wonderful creativity first hand! Oh my goodness! this is amazing! You girls are so talented I want to come and do some of your classes!!! I am off to see Sandes!! What a wonderful journal - I can see it is just chock full of ideas. It would be so much fun to attend a class like this. do you know of anyone in the Springfield, Missouri, area that has classes on such treasures?! I am sorry I do not know of anyone that is teaching this kind of project in your area. 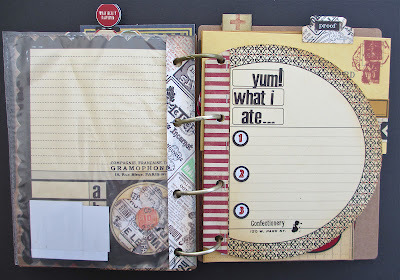 I would suggest looking at my friend, Tammy Tutterow's blog, http://tammytutterow.typepad.com/ if you don't already. She is in the St Louis area and might be able to help you if a class. What a great journal...sure with you girls were coming back to AIS in Brentwood this year... You girls teach the best classes ever!